The streets of Paris are coming to Roycemore School! Our annual scholarship auction and dinner will be held on April 27th, but online bidding for the auction is coming even sooner! 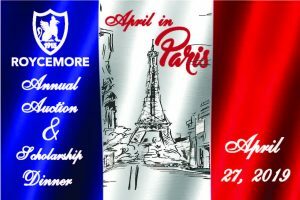 The annual scholarship auction allow Roycemore to expand accessibility and increase affordability. Beginning April 7th, Roycemore will be holding an online auction to raise much needed funds. We need Auction items to add to our auction. If you have valuable merchandise, rare collectibles, business or personal services or access to unique events we need your contribution today. Contact Sara at smcguire@roycemoreschool.org or (847) 866-6055 to take advantage of promotional opportunities for your business or to pledge your individual support. Buy a ticket or two. All ticket requests after April 25th should be sent directly to Sara McGuire at smcguire@roycemoreschool.org. 30% of our operating budget–over $1.8 million for the 2018-19 school year–is dedicated to tuition assistance and 50% of our currently enrolled students receive some tuition reduction. Your financial investment in Roycemore will provide opportunity for children to learn at their speed and in the areas that they are passionate about. It will support our small class sizes and individualized attention. Roycemore School is a non-profit 501(c)3 organization. Gifts are tax-deductible to the fullest extent of the law.Our Federal EIN is 36-1711590.